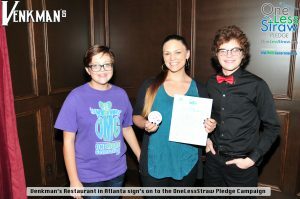 Olivia and Carter are pleased to introduce you to one of the latest restaurants to join the OneLessStraw Pledge Campaign. Atlanta’s very own Venkman’s Restaurant. Venkman’s is a restaurant and live music venue in the heart of Atlanta’s Old Fourth Ward. Executive Chef Nick Melvin’s creative take on comfort food classics are paired nightly with the eclectic live music lineup curated by Nicholas Niespodziani and Peter Olson of the Yacht Rock Revue. Venkmans is the place where you can bring a first date who you really want to impress or your truck-driving uncle from Mississippi. We strive to be that location where you can come hear great music, eat amazing food and sip on fantastic drinks… without plastic straws I might add. Olivia and Carter met with Venkma’s manager Somer Kearney who fell in love with the campaign and the fact that the kids were doing something to make a difference. Somer immediately signed up and said she would be ordering our cool OneLessStraw campaign buttons which help customers understand the restaurants willingness to make a difference and reduce their plastic footprint while also educating their customers on the reasons why we all should get involved. Next time you find yourself in Atlanta, we highly recommend stopping by Venkman’s and trying their amazing food. just check out their menu and you will see what we mean. Also, check their website before you come to see the awesome entertainment line-up they have in store for you and be sure to thank them for doing their part to help reduce the amount of plastic straws ending up in our environment.